"Let me tell you a story. I too, at times, have felt a great hate for those that have taken so much, with no sorrow for what they do. But hate wears you down, and does not hurt your enemy. It is like taking poison and wishing your enemy would die. I have struggled with these feelings many times." 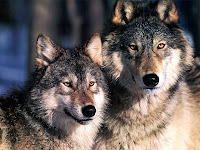 "It is as if there are two wolves inside me; one is good and does no harm. He lives in harmony with all around him and does not take offense when no offense was intended. He will only fight when it is right to do so, and in the right way." "But the other wolf, ah! He is full of anger. The littlest thing will set him into a fit of temper. He fights everyone, all the time, for no reason. He cannot think because his anger and hate are so great. It is hard to live with these two wolves inside me, for both of them try to dominate my spirit." The boy looked intently into his Grandfather's eye and asked, "Which one wins, Grandpa?" The Grandfather solemnly said, "The one I feed." sometimes human being must faced to choose between his/her demonic or goddes mind and heart for once in his/her life, otherwise to conclude on what kind chosen will become what kind he/she is...so which one you will choose?